Many companies use MS Visio to visualize their business processes. Some of them have recently started to use GenMyModel to close the gap between a drawing and a valid BPMN 2.0 model. We received hundreds of requests for supporting the import of BPMN models designed with Visio. Reasons are ordered as follows: modern UI/UX, great collaborative features, process validation and simulation. We are pleased to announce that we now support VISIO Import (for English diagrams). Since we launched our BPMN Editor in March 2015, more and more users asked us to accelerate in this way. That’s done. It’s now very easy to import all your modeling assets in our cloud platform. 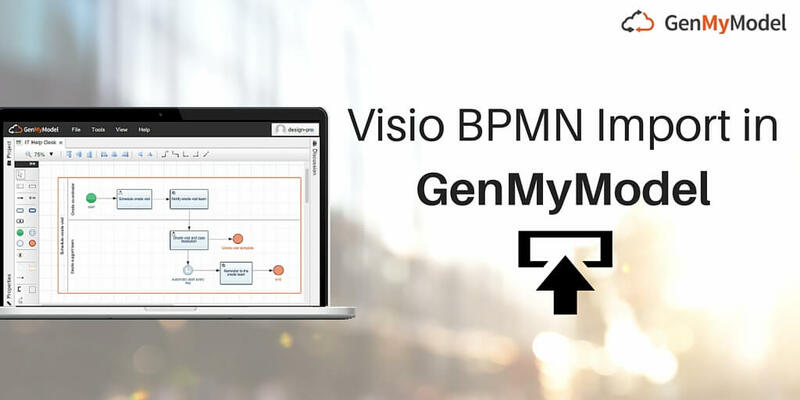 You will never have to recreate old Visio documents; 3 clicks from GenMyModel platform and your drawings are translated into compliant BPMN models. It’s now easier than ever to upload all your works in a cloud-based platform. You will be able to share models in seconds, to easily collaborate with your teammates (even in real time if necessary). Improve and facilitate your day-to-day work by trying a “central model repository” to store all models you need and to manage rights for your teams. Note that the GenMyModel Visio Import is based on the 2013 version of Visio (.vsdx files). This feature is currently in Beta, feel free to report any issues about your specific imports. We love your feedback. Team working is playing a key role in plenty of organizations and the real time collaboration is not a nice-to-have feature for them. That’s why we worked hard to make it more efficient than ever. The real-time execution gains stability and rapidity. BPM professionals need tools to better handle large models and that’s why we added the ability to move an entire model using the mouse – and its scroll button – for having a quick look of an other part of the model (without using the bar). You can instantly get a better overview of your multiple pools, lanes and tasks and handle complexity. We also released the automatic expansion of the canvas that can be activated when needed. Hope that will help.